Here it is- our September Stamp of the Month! 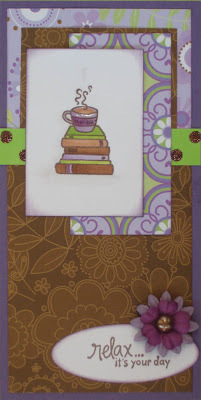 This month it's another two stamp combo, a stack of books & sentiment "relax... it's your day" from A-Muse Art Stamps! It's been ages since we featured a wood-mounted stamp, and for some reason I really wanted books for our SOTM this September- so these stamps seemed like a perfect fit. And then we started playing... and look at all the fun we had! I hope you'll enjoy them just as much as we have so far! 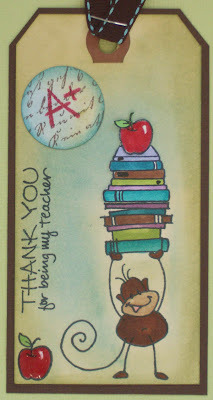 For this first card, I used a sketch from Mojo Monday (one from their '100' week) and papers by Doodlebug. I love the colour combo (and I'm really not a 'purple' person) and how well this sentiment, from last month's SOTM, works with the stack of books! Same papers, another Mojo sketch (maybe one day I'll use one during the actual week of the challenge)! 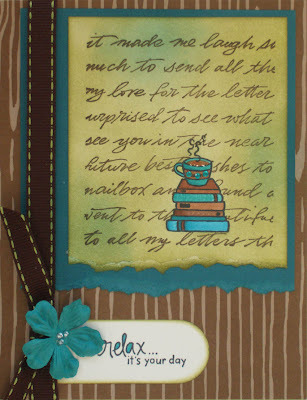 This background paper is by A-Muse as well, it's a nice cardstock weight wood-grain that makes a fabulous card base. I masked the stack of books and stamped this text background by Hero Arts over it, then coloured it up with some shades of Distress Ink before removing the mask and colouring with my Copic markers (yes- ALL the sample cards are coloured with Copics this month)! 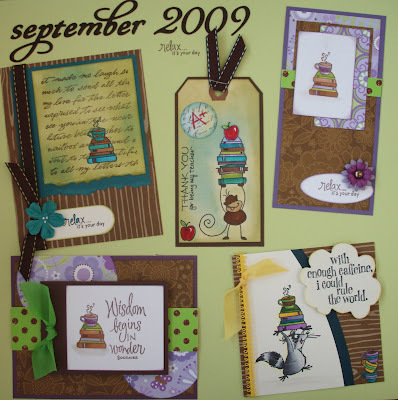 I was strongly encouraged to use the stack of books together with Rocco Raccoon (by Stampendous) which is a new favorite image of mine (and we're all sold out... I'll be ordering more soon, let us know if you want him)! 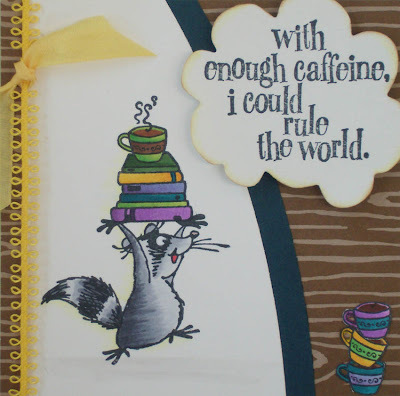 Rocco can lift up all sorts of fun things, but books & caffeine seemed a great start! The sentiment is by Inkadinkado. 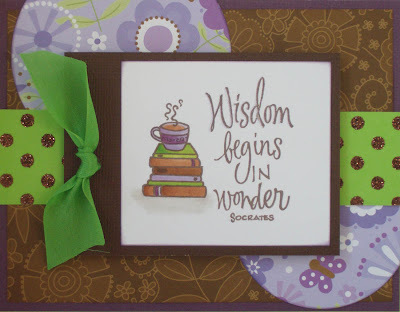 I shaped the curve on the image with one of the QK bracket dies and the sentiment is stamped on a tree top- I love using QK dies for new things! Hope you enjoyed the samples for our September SOTM... and I hope you have a fabulous month! I can't wait to see what you come up with using the stamps. If you're not already a part of our SOTM and want more info on it, ask us for details next time you're in the store! That little raccoon is so cute! Love the comment on the last card! What stamp set is that?